Since moving to the farm, I have taken it upon myself to expand my baking horizons and become proficient at the baking of bread. (Note: I said ‘proficient’ not ‘expert’) I have made plenty of cinnamon rolls, banana breads and muffins in my time but I have always been discouraged by my attempts at a “simple” loaf of bread. I feel that this deficiency is a real setback on my quest to stockpile homesteading merit badges. A year ago I attended a fantastic class at Brooklyn Kitchen on baking artisan sourdough bread in the European tradition (think crusty Italian loaf, not tangy San Francisco 4 lb bread ball…though I adore those as well). The instructor gave each attendee a jar of starter that he’d been cultivating for years, and later that week in my own kitchen the first loaf I baked with that starter made me feel like a superstar. It was crusty and delicious − but by requiring 3 kneads and a couple hours’ rising time between each, it took about 6 hours of serious effort to bake. I tried to keep the starter alive, but each subsequent loaf I made came out less and less appealing. The last one turned out more like a ball of crusty play dough than a loaf of bread. Needless to say, I’ve steered my attempts at farm-fresh bread more toward the sandwich loaf variety than the fancy-pants artisan types. Still, typical me insisting on making things complicated, I’m really aiming to bake whole grain bread… I mean, if I’m baking my own, I ought to make it as healthy as can be. Great idea, except as I’ve found, it’s about 10 times more difficult to get a whole wheat dough to rise than I thought. Those little wheat-kernels are heavier and less agile than the naked, bleached and finely pulverized grains of all purpose flour. 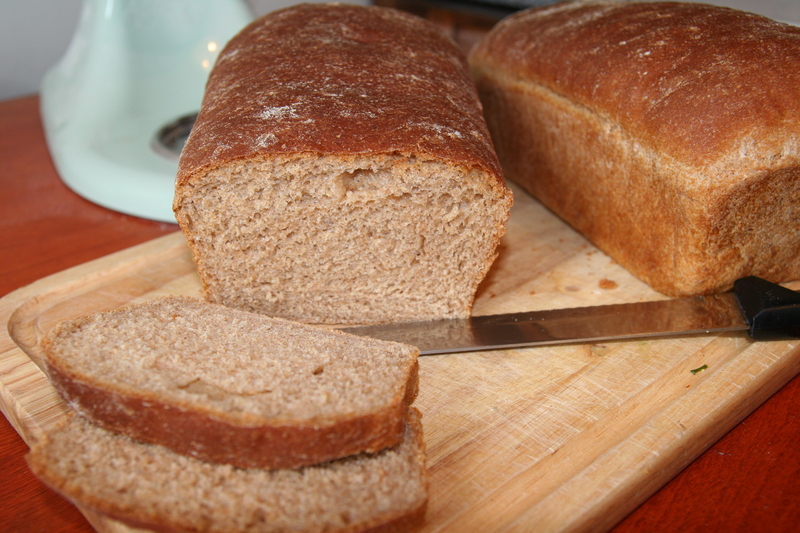 Over the past 3 months, I have baked 2-3 loaves of bread each week, and would say my success rate at achieving the light, tightly crumbed ideal slice of sandwich bread has been about 15%. Most every one turned out dense, even grainy, refusing to rise like the lovely “100% Whole Wheat” loaves you can buy at the store. To forestall utter discouragement, I’ve occasionally diverted my attention and at this point have almost mastered pita bread (seriously tasty with home-made hummus), pizza dough, and hamburger buns — all made with stretchy, silly putty-like white flour doughs. But this week, I think I have struck upon the winning whole wheat recipe! At the library I picked up Peter Reinhart’s Artisan Breads Every Day and I think he’s got the method down for coaxing stretch power and complex flavor from that pesky whole wheat flour. Oven spring? Yes, please! So what if I have to wait a day to bake the bread? I can work with that. Let’s just hope this method keeps working. I need to push my success rate up to at least 50%. One helpful tip learned the hard way: use “whole wheat flour” like this one, not “graham flour” − the flour particles are lighter and fluffier. Unless you were hoping for a whole wheat brick (or a sweet delicious cracker) then by all means, go with the graham. 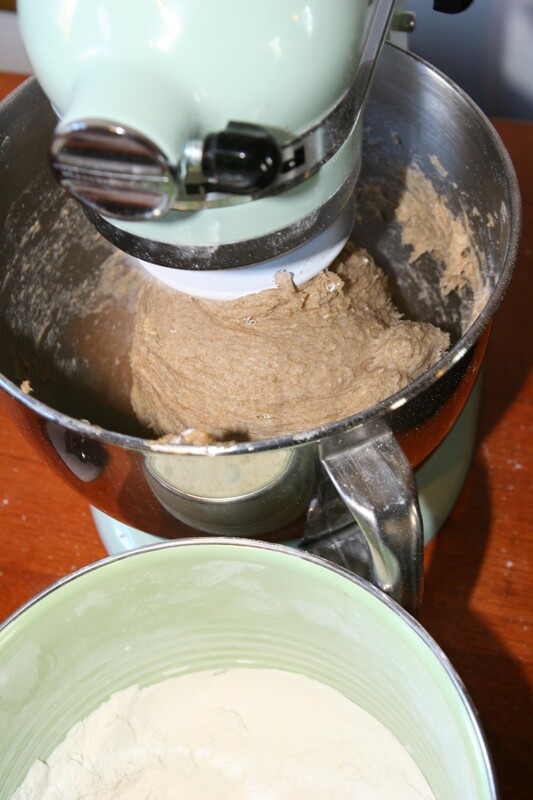 Becky – try white whole wheat flour. Same healthy ingredients but not as heavy! My sister-in-law told me about it. Really makes a difference. Great blog! It is great to see your blog and it makes me hungry for some homemade bread, Becky! May your success rate continue to rise, like the dough with which you work. At yeast it will taste great! Maybe a loaf might make its way west later this winter??? Sounds soooo yummy! I can almost smell the yeast and the warm, just-out-of-the-oven bread! I’m glad you stuck with it. Have you ever tried using a bread machine….or is that cheating??? It wouldn’t be consistent with your back-to-nature homesteading spirit though. I love reading your blogs! When your Dad and I were just little kids, our parents moved us from the city (Evanston IL) to the country (Woodworth WI) . My Mom learned to make homemade bread and even pasteurized our fresh-from-the-cow milk. We grew lots of veggies like you are doing. It was not to last too long though, as we moved back to the city four years later. But, it was a wonderful way of life for us to experience for the time it did last.